You don’t need to remove linings to insulate existing lined wall cavities. These can be insulated by drilling and filling holes through the external or internal lining with either a water repellent dry fibre or wet foam system. With either existing wall system there are usually three to four 25-30mm holes drilled in the wall, about every 500mm around the building. Total R-value (installed) of R2.1 -R2.6 is achieved in a typical 90-100mm wall cavity with water repellent dry fibre or R1.0 – R1.5 with wet foam system installed correctly. Unplastered or unpainted brick veneer cavities should be sealed first with either system, due to the high potential of wind driven rain entering such unsealed cavities. 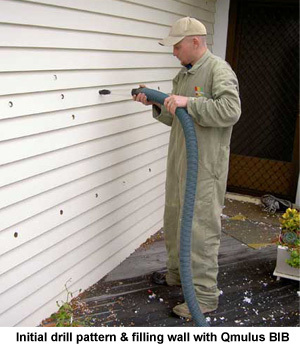 CosyWall is a dry, water-repellant, mineral fibre existing wall insulation system, which is installed at the optimum design density to prevent settlement and ensure that the Total R-value is achieved and maintained. With the CosyWall system holes are plugged with filler immediately after the insulation is installed, then sanded, primed and finish coated. 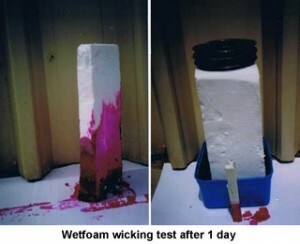 CosyWall water-repellent, dry, mineral fibre system tests indicated no wicking after 30 days and no settlement after six months at the design density. 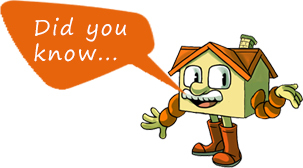 CozyWall insulation prevents potential fire spread in the cavity and reduces noise transmission through the walls. Wet foam systems are usually manufactured on site from urea formaldehyde chemicals and water, or occasionally urethane foams. Installation of these systems is more complex, which often means long-term that the Total R-values (installed) are considerably less than that stated by suppliers.